Digital signatures are a legally binding way to affirm your agreement to PDF documents. They can include your name, your organization information, your e-mail address, and the date and reason you signed the document. Typically, though, digital signatures are cold, computer-generated text. For an extra touch of class or personalization, why not use your real handwritten signature in digital signatures? 1. 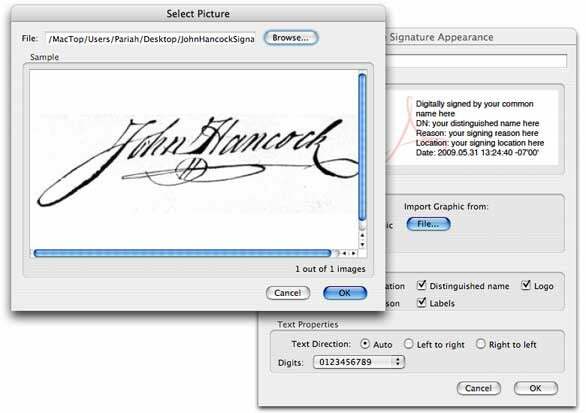 Scan your handwritten signature into the computer and save in PDF format. You can either scan directly to a PDF via the scanner’s software or use Adobe Acrobat’s File -> Create PDF -> From Scanner command. Alternately, you can first scan your signature as a graphic and then convert it to PDF format. Whatever technique you use to get your signature into PDF format, the important thing is that it must be a PDF cropped to the size of the signature itself. For best results, write your signature using solid black strokes such as those you’d get from a felt tip pen, and a little larger than normal. 2. Once you have your signature PDF ready and saved in a convenient, permanent location on your hard drive, open the Acrobat 9 Preferences and go to the Security pane. 3. Beside the Appearance block, click the New button to open the Configure Signature Appearance dialog box, and, in that box, title your new signature with a descriptive name, something along the lines of “With Hand Signature” or “My John Hancock” would be perfect. Select Picture shows a preview of the selected file, in this case the scanned signature. 4. In the Configure Graphic section, select the Imported Graphic radio button and click the now available File button. 5. In the Select Picture dialog box, browse for and open the PDF containing your scanned signature. It will open in the Select Picture dialog to give you the opportunity to confirm visually that it’s the image you want. Once satisfied, click OK to return to the Configure Signature Appearance dialog. You’ll notice that your hand signature is now a part of the digital signature preview. 6. Fine-tune the appearance of your digital signature by deselecting some of the checkboxes in the Configure Text section or changing options under Text Properties. To create a digital signature that is exclusively your handwritten signature, for example, uncheck all the boxes in the Configure Text section. 7. When you’re satisfied, click OK to save the digital signature appearance, and then OK again to leave Acrobat’s Preferences. Note that in the free Acrobat Reader you can sign documents in this fashion (if that option has been enabled by the PDF creator in the original Acrobat document), but you cannot create new signature appearances that include images. Your signature is now ready to use with a digital ID for signing new documents. If you don’t yet have a digital ID, or aren’t sure how to use the new signature with it while signing, check out our Digital ID how-to on Monday. Updated to correct the publication date of the second part of this series. The Digital ID how-to will run on Monday 8-17.